Trust me on this- I have lost many tender lettuce and other spring seedlings by planting them on sunny days when it’s fun to be outside! Unless there is a way to shade them, it’s best to put them out on overcast days or at least cooler sunny days. A perfect day would be one that is a mixture of sun with clouds, with the highs around 65 degrees. 1. My #1 tip for success: water the flat of seedlings really well, making sure that each sell is quite damp. Do this about 1-2 hours before planting – this is an easy way to help your little seedlings transplant well. 2. 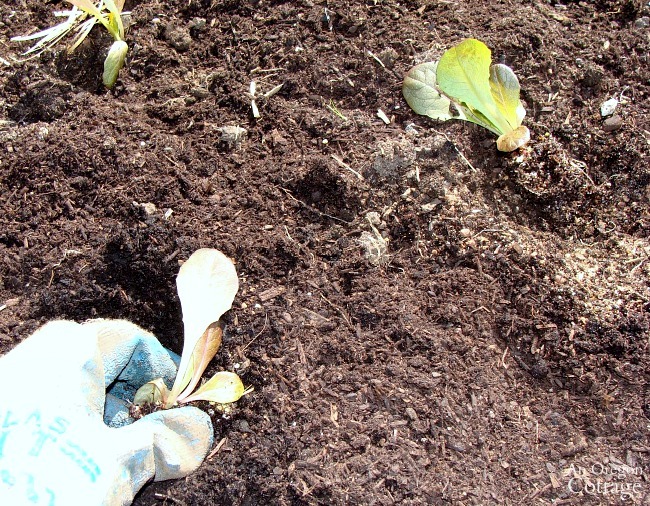 Prepared the garden bed – weed and spread a layer of compost. 3. Make holes at the spacing desired. Using lettuce as an example in a raised bed, I like to plant alternately: 4 plants in one row, 3 in the other so I can plant a little more closely, but traditional rows work as well. Tip: one of my favorite, quick ways to make small holes for seedlings is to use an English Dibber, which works for seeds, too, and is easy to drag through a raised bed to make a row for planting. 4. Fertilize. Add about a 1/4 cup of organic fertilizer and mix it into the soil of each hole. 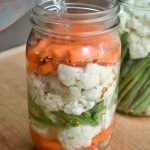 You can buy an organic fertilizer like this one or make your own like the one I use from Steve Solomon’s book, Growing Vegetables West of the Cascades. 6. If two seedlings are growing in one cell GENTLY pull the seedlings apart (this will be much easier if you’ve watered them well in Step 1). 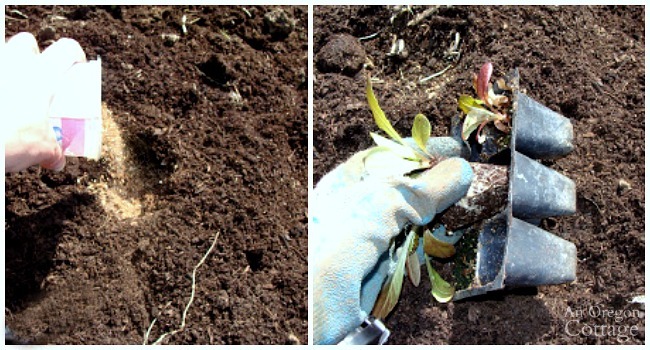 Grasp the section of root beneath each plant and start gently pulling apart to get as many roots separated as possible. Tip: Even if they don’t separate evenly and you have one plant with all the root ball and one with just a bit, plant them both anyway – most of the time they will both grow! 7. 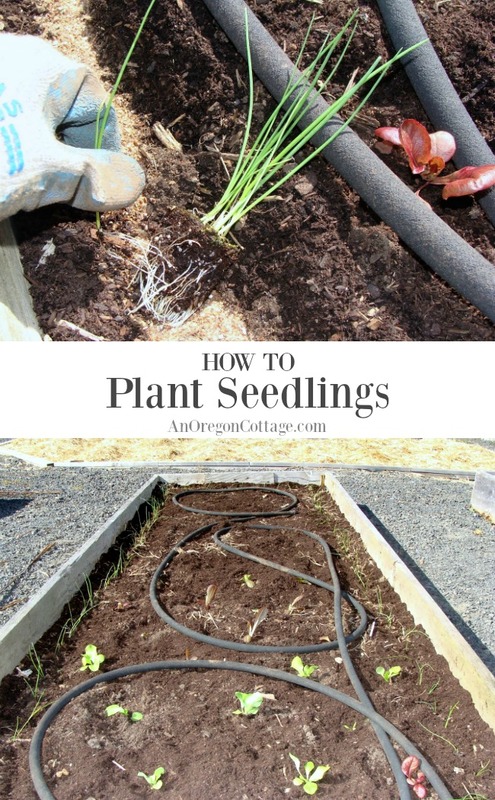 Plant your seedlings in the prepared holes, bring the dirt around them and press down to firm it well, to make sure that all the roots are coming into contact with soil and there are no air pockets. 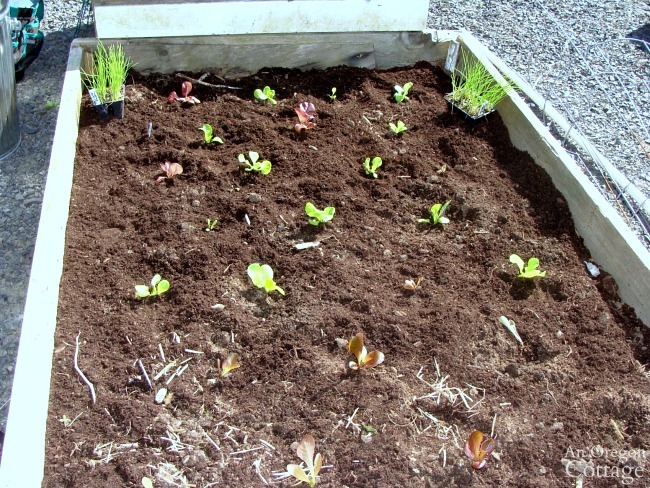 This picture above shows all the lettuce seedlings planted in an alternate planting method. 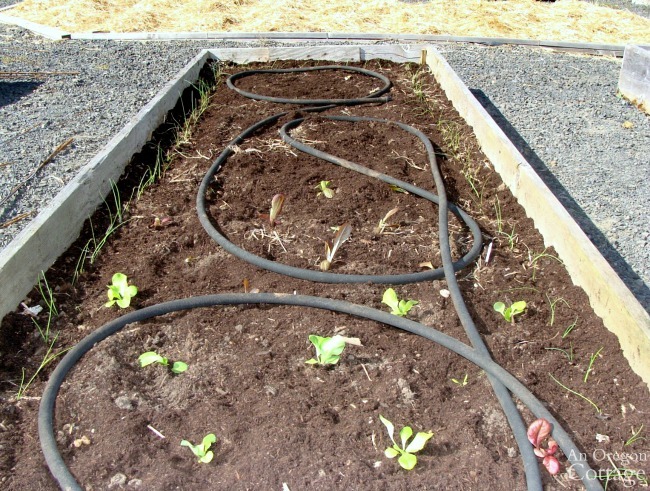 Tip: The onion seedlings in the corners will line the raised beds – it’s a good use of space, and it’s pretty, too. 1. Dig a shallow trench as long as you need. 2. Add a line of organic fertilizer and mix it into the soil. 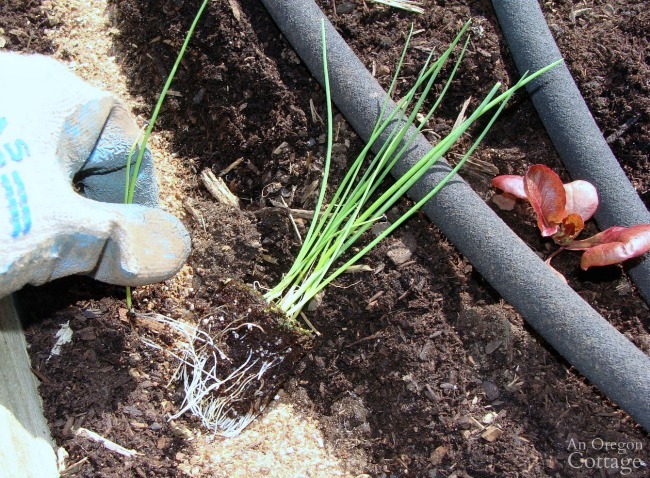 Onion space-saving tip: lay them in the trench at closer spacing than recommended (about 2-3″ apart) and then as they grow, pull every other onion for green onions, giving the remaining onions room to grow larger bulbs. This is a great use of all your space, in my book! 4. Then back-fill with the soil and firm everything in place around the seedlings. When finished, the bed doesn’t look like much does it? But these little guys will grow, grow, grow and soon you won’t see any soil- trust me! 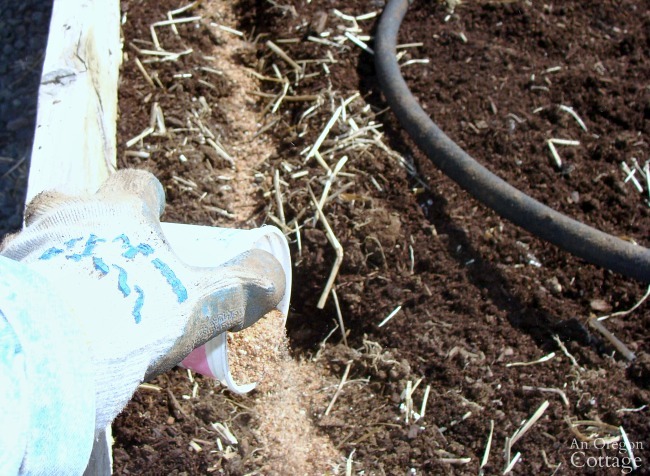 Tip: If you are using a soaker hose like I do (and I hope you are – or some type of system to water at the roots- for both easy care and healthy plants), make sure it’s in place now, since it will be harder to set after the plants have grown. 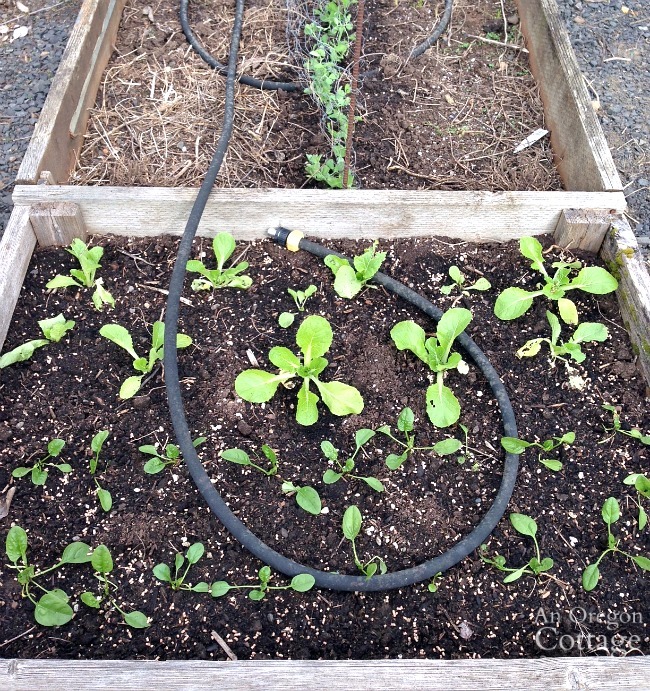 This small bed (at the end of a larger bed planted with peas) holds spinach in two rows and Chinese cabbage planted alternately. Sort of. Sometimes I squeeze a few more seedlings if they are small to see if they’ll make it – and if they do I transplant when they’re stronger. This bed holds broccoli, cauliflower and cabbage (also called cole crops or brassicas). 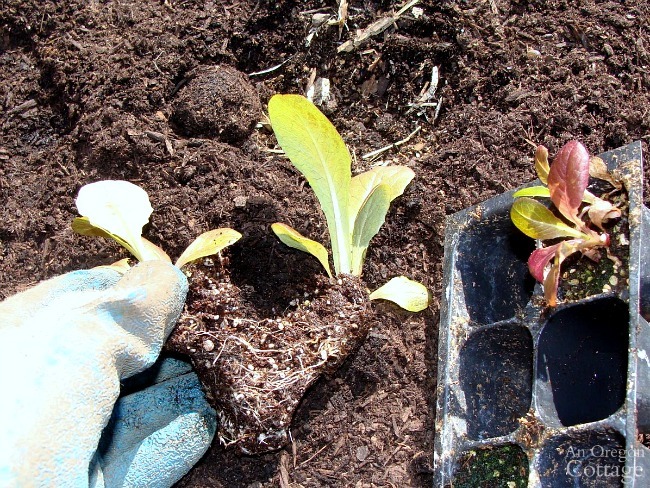 This again uses an alternate pattern planting method like the lettuce, but these seedlings are spaced at a 3-2 plant spacing to allow for their eventual bigger sizes. 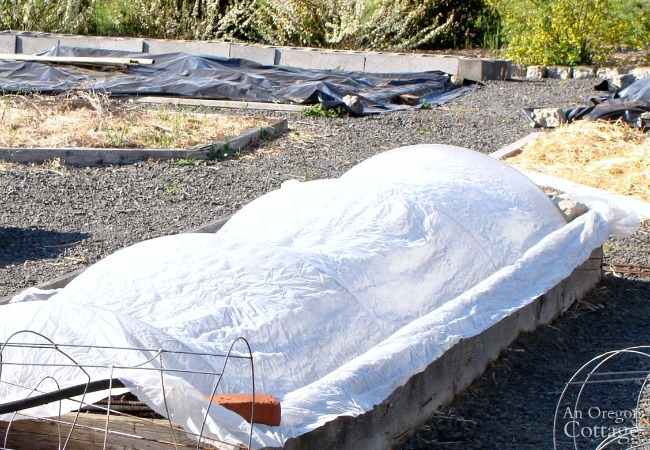 Cover your broccoli, cauliflower, and cabbage starts with a floating row cover! After using them for years after losing whole crops to aphids and worms in the past I’ve found this really keeps them clean AND they grow better under the slight insulation the cover provides. Win-win! You can read more on why row covers are the way to go with your cole crops here – including the amazing cover-and-not-covered pictures. See the other posts in this series here. Jami, you have posted excellent information!!! Thanks so much. I’m so glad you’ve found it helpful, Janelle! 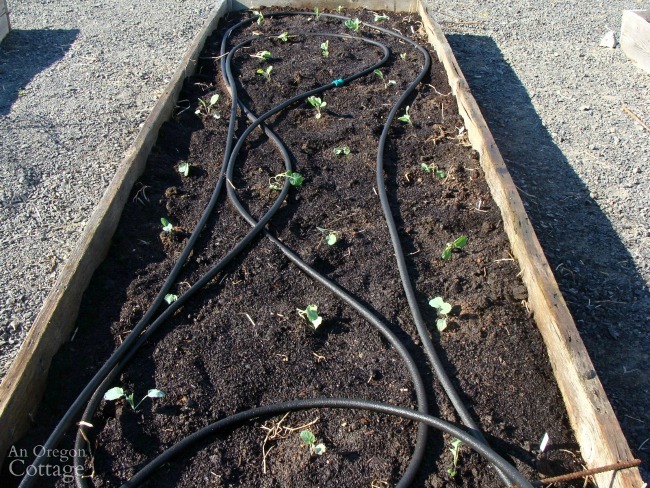 When do you use row planting and when do you plant alternately? Does it just depend on the size of the mature plant? 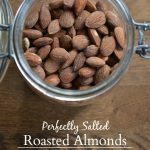 I don’t really have a hard-and-fast rule, Sharon, sometimes just do what I feel like, ha! But typically it’s based on two things: how big the plant gets and how much room I have. So my smaller raised beds tend to get planted alternately and on the larger beds where I grow corn, beans and cukes, I plant in rows. Root crops are always planted in rows and sometimes quick-growing crops like spinach and cut-and-come-again lettuce, since it’s picked small. Does that make sense? How do you keep your gravel walkways clear of weeds? Well, we lived and learned, Karen. 😉 We laid our vegetable bed paths first and used whatever a truck would deliver – which ended up being full of ‘fines’ which turned out to just be sandy dirt. This created a lovely layer of dirt under the gravel that just LOVES to grow weeds, so we fight that all the time in there, constantly pulling (which is easy, since we laid it on plastic) until they stop around July. Needless to say – I didn’t make that mistake again and our other paths and gravel patio are made with black plastic layered with gravel without fines – very important. We get a few easy-to-pull weeds in these areas only – it’s a huge difference. So get gravel without fines- or pea gravel, though I find that harder to walk on.